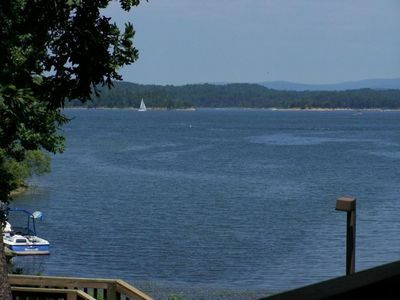 Fully stocked 2/2 condo on Lake Ouachita located in Mountain Harbor Resort. 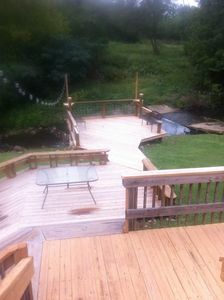 Come relax on the back deck over looking the peaceful woods. Master features private bath with standup shower and king bed with TV. Second bedroom features twin over full bunk with tv. Washer and dryer in unit. Secondary bath stocked with towels and features tub/ shower. Full pullout couch in living room. Kitchen is stocked so just bring your groceries. This is a lower unit just 100 steps to the pool and Turtle Cove Spa. Tennis and basket ball courts are short distance. Resort also boasts riding stables, hiking trails, boat or slip rentals and world class fishing. This is our second "Tree House" in Mt. Harbor Resort. We loved our first one so much that the day this one was listed, we said YES !!! Located in Harbor East, this unit is on the upper level at the end of the lane with no neighbors to look upon. There is a rare straight in walk way with no steps making for an easy in and out with your luggage and coolers. The front entrance brings you into a light and airy updated kitchen with all the amenities of home including a keurig with k-cups provided. Feel free to whip up family meals with a well stocked kitchen that includes pots. pans, bake ware, dinnerware, flatware, glassware, utensils, and a crock pot for those long days outdoors and a welcome hearty meal upon your return. The bar seats 2 and the dining table seats 6. A skylight and floor to ceiling windows make the dining area very inviting. 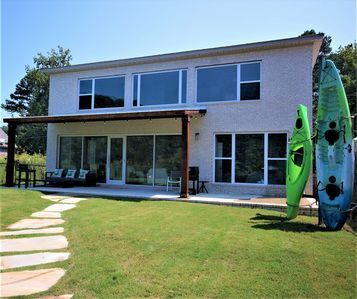 The vaulted ceiling extends from the dining area into the living room where more floor to ceiling windows let you get an unobstructed view of the Ouachita National Forest. A full size sofa, over-sized chair and ottoman make the living room the perfect place to curl up with a good book, enjoy the wood burning fireplace (wood is provided), or watch one of the DVDs provided. Games are also provided so you may enjoy some 'off screen' time with the family. There are 2 bedrooms each with all the comforts of home including extra linens and pillows. Each room is equipped with a TV and satellite programming. The master has a comfy king bed and private full bath as well as access to the back deck. The guest bedroom has a queen bed and a full bath that may be closed off for the privacy of an en-suite bath. Both baths are supplied with linens, soap, shampoo and a few other comfort items to make your stay more enjoyable. All rooms are freshly painted and all flooring has been recently updated. Outside, you will find a deck that is larger than many of the resort's other units and is also finished with a pebbled rock. An outdoor dining set for 4, comfy bench for 2, and gas grill will make lounging outdoors very enjoyable as you enjoy the tree house view into the forest. The back of the property is nothing but Ouachita National Forest as far as you can see. In winter months, the lake is visible through the trees. At any time of year, you are sure to see herds of deer passing through or hanging out. All pools at Mt Harbor are available to our guests. Enjoy the newly renovated pool just steps from your condo with a nice shaded lounge area and cool walk concrete surround. Beach towels are provided in the condo. A washer and dryer units are located in the hallway along with detergent. WIFI and Satellite TV. We take pride in the care we take of other's homes and being responsible pet owners who travel often. We believe our guests will do the same so we do not charge a cleaning fee nor do we charge a pet fee. Should you have a need, cleaning supplies are readily available under the kitchen sink, a broom and mop are in the laundry closet, and a vacuum is located in the master closet. Parking is limited to one space marked in front of the unit. All other vehicles or anything in tow must be parked in overflow parking which is a short walk and visible from the condo. New to the rental market and completely renovated! All new paint, trim, flooring, plumbing and electric fixtures, appliances and furnishings. Kitchen is fully stocked. 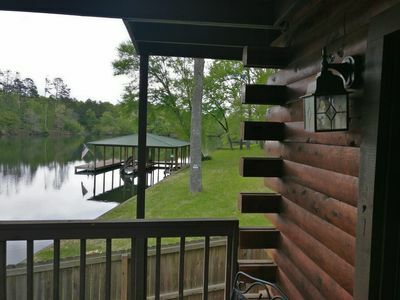 This is an upstairs unit with Vaulted ceiling and deck just steps from the pool and lake. Located in Mountian Harbor resort. Enjoy numerous activities such as boating, hiking, tennis, basketball, fishing, horse back riding. Visit the Lodge or Shangri La Cafe for lunch. Marina with fishing gear and rentals available. There is a play ground for the kids. Condo has a pack n play as well as a travel type highchair. Propane grill on back deck over looking the trees. This is our vacation spot so we have pulled out all the stops in comfort and cooking as that is what we enjoy! We look forward to sharing our little slice of paradise with you! The kitchen has been renovated with SS appliances including induction range/ convection oven. All kitchen furnishing are new and great quality. You will also find an instant pot, crab leg utensils, Ninja blender and a Sous Vide immersion circulator. Any thing you want to cook with, you should be covered! Master features King bed with new Hybrid mattress and luxury linens. Extra pillows and pool/lake towels in closet. 43in Smart TV. Master bath with standup shower and stocked towels under the sink. Hair dryer located in bottom drawer. Wifi router is also located in master with access printed on the side. Secondary bedroom features two twin bed and one twin trundle, Smart TV and a Super Nintendo mini. Pool/lake towels and extra linens for sofa beds are stocked in the closet. Also find high chair and Pack N Play in the closet. Hall bath like wise has been updated with towels and hair dryer provided. Features tub/shower combo. You will find a 4 seat dining table in the dining/ living area as well as three bar stools. We have really enjoyed updating the condo with inspiration form a recent trip to Santa Fe NM. Some of the furnishing were left from the previous owner and we had fun updating then and incorporating them back into use. We hope you can relax and enjoy the space we have created as much as we do! Looking for that place at the lake that feels like home without the worries? This is it! Welcome to Lake Ouachita's finest resort community - Mountain Harbor! 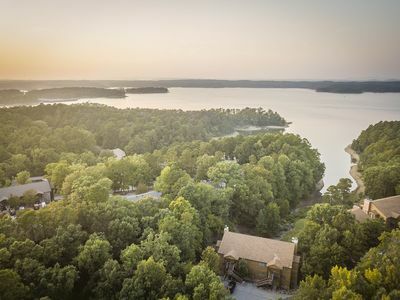 This well maintained resort abounds with amenities including outdoor pools, tennis and basketball courts, riding stables, full service spa, and easy access to hiking trails that will lead you through the gorgeous Ouachita National Forest. 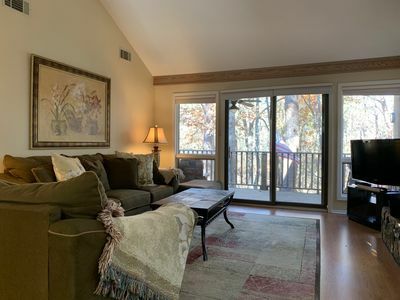 Our condo is just the right place to spend time with family and friends while enjoying the beauty and serenity of Lake Ouachita (pronounced "Washitaw"). You will be pleasantly surprised by all the amenities in this 1000 sqft Fully furnished condo that comfortably sleeps 4 adults between the 2 bedrooms and living room sofa. You won't find many units this nice at Harbor East. We stay here too and we want it to be comfortable for us and our guest. As you arrive, you will find yourself walking into a light and airy entry way that leads you through the kitchen and into the living and dining areas where you will find a natural stone wood burning fireplace and sliding doors to the large deck. Wood is provided for the fireplace. 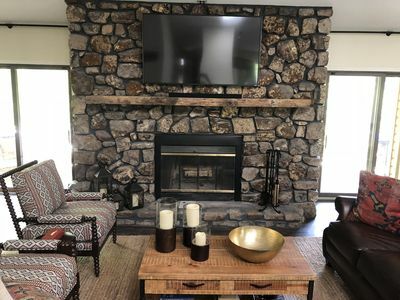 The living room offers 3 reclining seats to relax in at the end of a day of fun on the lake where you can enjoy satellite programming on a 40" flat panel tv or gazing at a nice fire on those cooler nights when a wood burning fire just makes everything better. The kitchen was remodeled in 2012 and is well equipped with dishes, cookware, utensils, paper goods, and small appliances. Paper goods include paper towels, napkins, plates, cups, plastic wrap, and foil. Coffee and condiments are provided for the standard coffee maker and a Keurig is available with a variety of k-cups provided. Dining is easy with 4 seats at the table and 2 more at the kitchen bar. The Master Suite offers a king size bed, dresser, night tables, lamps, and tv. 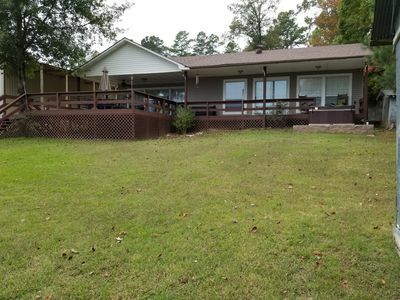 Sliding doors also lead to the deck where you can enjoy the peaceful view of the Ouachita National Forest. The second bedroom offers a king size bed, dresser, and night table. The hall bath can be made private to this bedroom by closing a door in the hallway. This is a great feature if only the bedrooms are used for sleeping quarters - it's like having 2 master suites! Both beds purchased new May 2016. The condo is fully stocked with linens for the beds and bathrooms including some extra pillows, sheets, and blankets for anyone who may like to stretch out on the living room sofa. You will also find 2 child size sleeping bags, over 20 board/card games, 4 tennis rackets, basketball, 4 square ball, and pool noodles, beach towels, and extra ice chests. On the back deck, you will find patio dining furniture for 4 and a charcoal grill plus a 2 seater glider. Turn on the ceiling fan to add to the breeze while you relax and enjoy the gorgeous "treehouse" like view. Keep your eyes open for deer thta frequently graze within view from the deck. A short walk (less than a minute) takes you to Harbor East Pool, Tennis & Basketball Courts, and Pavilion where you can play or relax. There are several great shaded areas overlook the pool so you can be cool and comfortable while the kids play. Pools are generally not crowded. This condo was NEWLY RENOVATED in May 2018 and is approximately 1,000 SF. Features of this condo include: WIFI, Vaulted ceilings in the living room, TVs in the Living Room and both bedrooms, CUTE kitchen stocked with full size refrigerator, stove, microwave, dishwasher, Keurig coffee maker, blender, etc. Dining table that seats 6, plus a bar with 3 bar stools, Washer and Dryer. The two Master Suites include: Suite 1: King size bed and full bath that can be closed off for privacy; Suite 2: TWO Queen beds and an oversized bath. Additionally, there is a sleeper sofa in the living room that sleeps 2. The back deck contains a gas grill and table and chairs for grilling and enjoying the outdoor scenery! 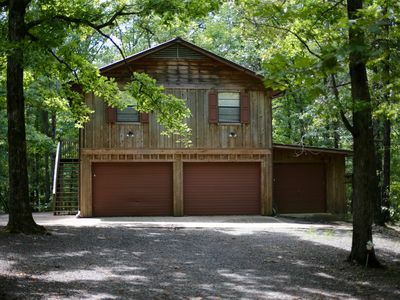 This upstairs unit borders the Ouachita National Forest and is great for wildlife watching. Come enjoy this peaceful paradise! For the for lowest rates on our Enchanted Forest condo which has a kIng in the master, 2 queens in the guest, sofa (not a sleeper), inquire today. Very close to the water. You can easily leave your boat in the cove for an easy walk to your condo. This is one of the most popular condos at Mt Harbor due to the lack of stairs and wonderful decor. This unit is fully stocked, very comfortable, large shaded deck with a gas grill. We hope you will call today to start you Lake Ouachita vacation. Off Season is Labor Day thru Feb 2019. We ride ATV's in the national forest less than 1/4 mile from your condos front door. Relax by the fire once back at home. 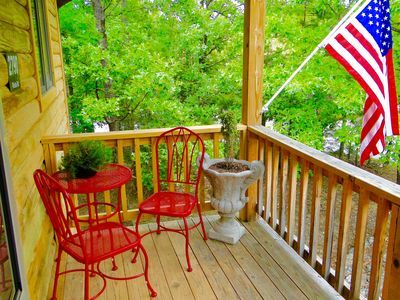 Sip your favorite beverage in your carpeted, screened in porch overlooking the lake thru the winter canvases. It's magical. Check us out, This Condo has a unique layout. Very Nice, especially the master suite. Not another one like it. This spacious condominium has ample room, fireplace, lake and wooded views, two bedrooms and two bathrooms. The fully equipped kitchen has everything you need to prepare meals including flour, cornmeal, sugar and canola oil. The dining area has seating for four to eight people comfortably. The living room has a very comfortable sectional sofa, comfortable chair in front of the cozy fireplace and large flat screen TV with DVD player. We will even leave age & gender appropriate movies upon request for your viewing pleasure. The screened in porch with twinkle lights has seating for your entire family. Along with a soothing water fountain. There are even canvases for the winter so you can sit on the warm and toasty porch sipping coffee in comfort while watching eagles fish in the cove. There is not a condo next door so you have complete privacy. We have gas grills for your convenience (propane provided). It has a laundry room, with full size washer and dryer and even comes equipped with laundry detergent and fabric softener. Some of our 7 units have stack washer and dryers. This fully equipped home even has foam rafts for the pool, ice chest on wheels, pool games and water noodles. It has a spacious and elegant master suite with a very comfy king size bed along with a TV and DVD player. TV can be viewed from the large Jacuzzi tub. Our guest room has two comfortable queen size beds with both TV and DVD player. There are even black out panels which teens love.The room stays dark, cool and comfortable all summer long. Not all of our condos are like our Treehouse unit. We own Lake Ouachita Vacation Realty and rent our units year round. These are the only condominiums located on this beautiful lake which is over 50,000 acres. This unit is within walking distance of the lake where you can park your boat and walk to your condo. You may also walk to the pool, Turtle Cove Spa, Workout Trail and hiking trails. We have it all. The horse stables are the cleanest I have ever seen. These horses are very loved and cared for. There is a weight limit so call first. We even have a kayak company that will bring the boats to you for a tour. Ouachita Kayak Tours is here for your convenience. Keywords: Mt. Harbor, Condo, Lake Ouachita, Vacation Rentals, Boating, fishing, wake boarding, skiing, Camp Ozark, kayak. Condo is fully furnished and includes: DirecTV, 4 LED TVs (55" in Living Room with Blu-Ray/DVD player), DVD collection, stereo/surround-sound, internet, fully stocked kitchen (w/full size refrigerator, stove, microwave, dishwasher, coffee maker, coffee bean grinder, Keurig machine, blender, spices, and etc. ), Xbox 360 in guest room (BYOG), large sectional couch, 2 leather recliners, coffee table that converts into TV tray, expandable dining table (extension is under the master bed), bar with stools, blowup mattress & electric pump, full size washer & dryer, wood-burning fireplace, gas (Weber) & charcoal grills, porch swing, deck furniture, pool toys, 4 tennis rackets, 2 parking spaces (overflow parking just steps away - also great for boat trailers). Master bedroom has a queen size metal frame bed and a large Jacuzzi bathtub. The guest room includes 1 bunk bed with 2 twin mattresses and 1 full bed. As you can see in the pictures, we are just a few steps away from the swimming pool, basketball court, and tennis court. The swimming pool also includes two covered gazebos that can be used for picnics, or for shade while watching the kiddos splash around. 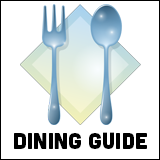 Turtle Cove Spa and Mountain Harbor Lodge Restaurant are just a short drive away as well. We also highly recommend visiting the Shangri-La Resort Restaurant - the food is very affordable and very tasty; they are best known for their delicious pies. 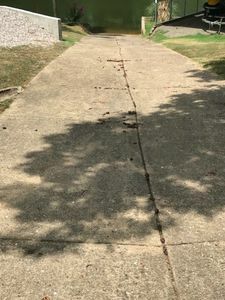 The lake is approximately 200 yards from the front porch and one of two public launching ramps is within 1/2 mile of the condo; boat slips are available for rent through the Mountain Harbor Marina. Address: 232B Vista Drive, Mt Ida, AR 71957 Our condo is pet friendly and smoking is permitted on the decks. Note: All boats must be parked in overflow parking - NOT in front of the condo units. 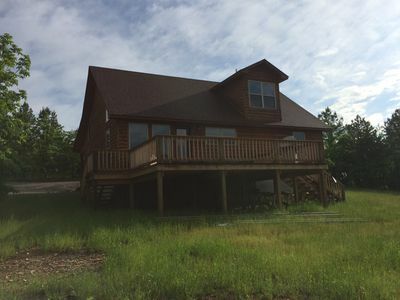 Cabin Located just minutes to the North end of lake Ouachita. Our cabin is a two bedroom home. Just minutes from the North end of Lake Ouachita. It has one bedroom with a Queen bed, and one with a full size bed. There is also a Queen size hide a bed couch in the living room. The bathroom is a bath and shower combo. The home is fully furnished for your basic needs. The home also has central heating and air. There is a grill for outdoor cooking, and it has a back porch swing where you can enjoy your morning coffee. There is also a patio table with chairs for outside eating enjoyment. There is plenty of yard room for kids or your pets to enjoy. This property is located in a quiet (neighborhood). The home has a privacy fence that surrounds the property. The location is thirty five minutes minutes from the beautiful town of Hot Springs where you can visit the Historical Bath House Row, and enjoy the sites. Have a day of shopping or dining . Hot Springs Village is 25 minutes away. There is a little country store right down the road from the home if you need to grab a soda or some fish bait for fishing. They are open Wednesday through Sunday and they have BBQ on Saturday and Sunday. The home is (non-smoking), but you may smoke outside. Super Low Rates Just For April and May! Warm weather is here! Time to go to one of America's most beautiful lakes! Mountain Harbor, Lake Ouachita's premier resort community, is situated in the beautiful Ouachita Mountains surrounded by natural springs, winding rivers, tall pine trees, stunning mountains all highlighted by the amazing 49,000 acre Lake Ouachita with its incredible view from most any vantage point. For over 25 years, Lake Ouachita has been our favorite getaway. This condo was our first home away from home at Lake Ouachita. We have since purchased another home just around the corner! The condo is furnished with comfort in mind. The entire group can easily gather on the HUGE sofa! Photography from around the lake can be found throughout our condo. Our condo is an extra large two bedroom/two bath floor plan with 1,416 square feet of living space. Situated on the upper level, access is made easier by a ramp and front porch that was just recently rebuilt extending from the two car parking area rather than the standard steps found on most Harbor East condos. With three queen sized beds and a queen sleeper sofa, it will very comfortably sleep six to eight people. The Master Bedroom has one queen bed. The second bedroom has two queen beds. We have found that the kids actually love sleeping end to end on the giant L-shaped sofa. We have had up to four kids sleep there by removing the back cushions without unfolding the sleeper section! 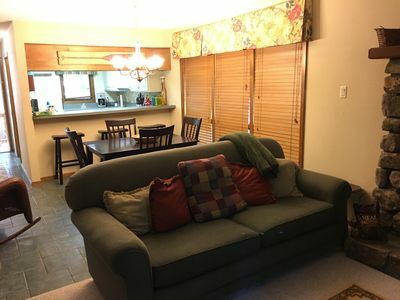 As you enter our condo you are greeted by an Entry Hall that leads to a large Living and Dining area with vaulted ceiling and ceiling fan overlooking the forest and the tennis courts via the wrap-around deck. Skylights and lots of windows give you the illusion that you are living in a tree house with great views of wildlife in the evenings and birds most all day long. A 40" Sony television with Dish Network is available for your entertainment. A lovely stone wood burning fireplace finishes the room that features some furniture custom built in my woodworking shop! The wrap around deck is accessed via two different french doors with roman shades. The deck, with plenty of seating and a Weber BBQ grill, invite you to the great outdoors, while not leaving your comfortable surroundings. Two ceiling fans will keep you cool on those warm afternoons. The dining table seats six people with seating for two more at the adjacent counter looking into the recently remodeled kitchen. Kitchen: It features a huge side by side refrigerator/freezer with water and ice in the door. A solid surface electric cook top with oven, dishwasher, and trash compactor complete the kitchen which is fully stocked with pots, pans, silverware, plates, glasses and wine glasses... even a crock pot! You'll find everything you will need to serve your family and friends while you are guests with us. 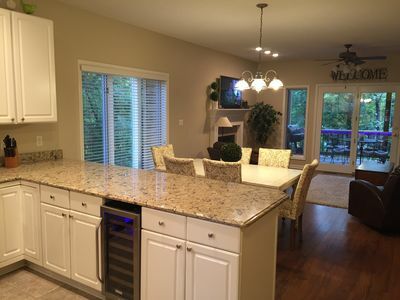 Updated floors and granite tile counter tops round out this well equipped kitchen. The Master Suite has a very comfortable Queen bed and a wall mounted 40" Sony TV with Dish Network and DVD Player. Bedside tables with lamps finish the room. It has a separate door leading to the deck as well. The Master Bathroom has a double vanity, huge double closet and drawer sets with lots of mirrors. Skylights grace this area as well letting in lots of natural light in the dressing area. The shower/tub is glass enclosed. Plenty of soft, fluffy towels are on hand for your use. The Second Bedroom features two queen beds, chest of drawers, side table with lamp and a rocking chair. It has a 24" Samsung HD TV with Dish HD Service. The Second Bathroom is just outside the bedroom door and features a stand up glass enclosed shower and vanity. A towel chest stores all of your towels and other linens for the condo. Because we upgraded the washer and dryer to handle bigger loads (lots of towels from the day on the lake! ), the full size washing machine is located in a closet in the second bathroom, with the full size dryer located in the entry hall closet. Our condo is located just 5 minutes on foot to the Turtle Cove spa or the swimming pool and just 30 seconds to the tennis courts. 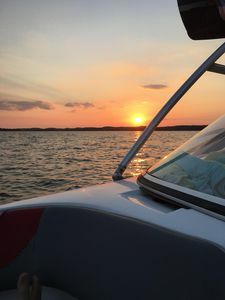 If you choose to rent a boat slip from Mountain Harbor, you are just 3 minutes by car from L Dock and the paradise of Lake Ouachita! Nice quiet Lakehouse on beautiful Lake Ouachita. This is a mobile home located in the beautiful Ouachita national forest. The home is walking distance to Lake Ouachita which is one of the cleanest and clearest lakes. We use this second residence often for hunting, hiking, fishing, mountain biking, kayaking, and recreational boating with our kids in the summer. It is VERY casual and also pretty remote. We offer kayak rental. In order to turn on the water/ hot water you must turn on two breakers that are located to the right of the dryer in the laundry room. It may take 20-30 minutes for the water to warm up. This is a remote area in a national forest so the TVs don't receive local channels. You can use your hot-spot on your phone and a chromecast or roku and connect to the TVs. Please make up the beds with clean sheets prior to leaving. Wash and dry towels and sheets prior to leaving. Please clean all dishes prior to check out. Guests must take out trash and replace with trash bag prior to checkout. Please turn the AC up to 80 in the summer and the heat down to 60 in the winter prior to checking out. Please sweep up any messes and wipe off the countertops. The area is remote and there is not always a cleaning service available to clean in between guests so please leave it clean for the next person! We use this space frequently and clean when we are home; we want everyone to have a good experience! Sleeps 8. Large 2 bedroom, 2 bath 1450 sq ft condo with lake view and access to water’s edge within 200 feet of condo. Great bank fishing and accessible by boat. Large wrap-around covered deck with rocking chairs and swing overlooks the lake cove below. Newly painted, new carpeting and all new bedding in 2018. 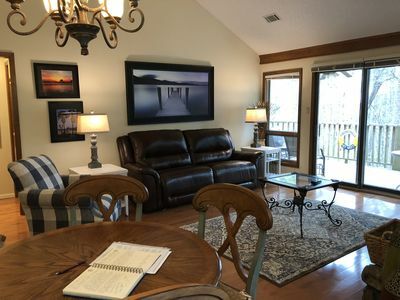 Condo is fully furnished including high-speed cable internet hookup, a fully stocked kitchen, three big screen HD televisions with DVD/VCR players in great room and both bedrooms, DirectTV, charcoal grill/smoker, wonderful porch swing and rocking chairs overlooking lake. 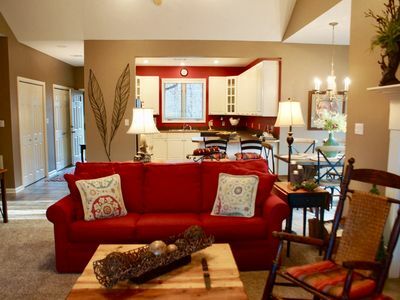 The unit is beautifully decorated with bright designer colors, Bev Bev Doolittle limited prints, original tapestry wall hanging, leather recliners in the great room, wood-burning fireplace, and 20 ft high vaulted ceiling. (Only condo in Mt Harbor with 20 ft vaulted ceiling.). Guest bedroom has Bev Doolittle prints. Master bedroom has a king size brass bed and master bath has a Jacuzzi bathtub. Second bedroom has four twin beds. Queen size sleeper sofa in great room will sleep two children. FIREPLACE TIME!!! 1450 sq ft 2BR 2BA beautifully decorated condo. So peaceful. 2 Bedroom, 2 Bath Condo at Mountain Harbor awaits! Sit back, relax, and enjoy the beautiful scenery of Lake Ouachita! 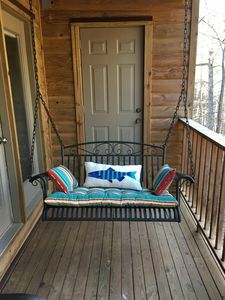 This charming condo sits atop the trees in the wonderful Mountain Harbor Resort and is walking distance from the pristine waves of Lake Ouachita. Enjoy all the amenities of the resort. Book a spa day! Take a dip in one of the many pools! 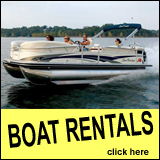 Rent a boat and enjoy the lake! If you want to venture to Hot Springs, you are only 30 minutes away! This recently renovated condo boasts an all new kitchen, beautiful wood floors, and a stunning deck that will make you feel like you are sitting on top of the trees! With 2 king beds, you will have plenty of room to spread out and relax! Wifi and cable are included so you can cozy up to a fire and watch a movie! Come experience the tranquility of the Ouachitas with all the luxury of Mountain Harbor! Our home is just minutes from the North end of Lake Ouachita. You are only three minutes away from Rabbit Tail water trail, where you can put your boat into Lake . You are also, only eight minutes from Buckville Recreation where there is a swimming, and a picnic area and also a boat ramp. The home has 1390 square feet of living space. There is a fenced in yard with parking outside the fence. It has a new central heat and air unit. The home has two bedrooms, one has a Queen size bed, the second bedroom has two twin beds. There is also a Queen sleeper sofa in the living room. 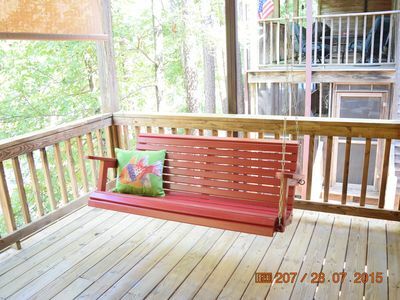 There is a long open front porch where you can sit, and enjoy your morning and evenings. There is a country store right down the road from the home that carries fishing bait and a few basics they are open Wednesday through Sunday. Hot Springs is 35 minutes away where you can visit Bath House Row where there many shops, and restaurants for you to dine in, or shop at. If you are staying for a few days there are grocery stores in Hot Springs Village so you can stock up. If you enjoy digging for Crystals drop by the Crystal mine in Jessieville, Arkansas. At the end of the sit around in the spacious living room and talk about the great day you had. 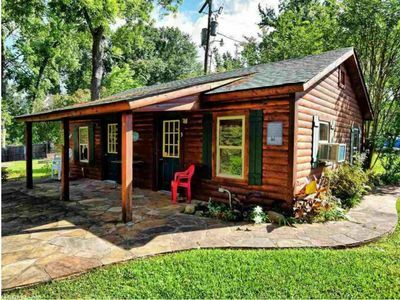 Tranquil 3 bedroom 2 bath vacation home nestled in the woods. 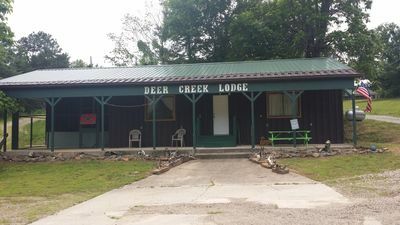 Newly remodeled located in Twin Creek on Lake Ouachita. Slow down and relax in comfort. Get away from the city for a long weekend. Enjoy the beautiful fall colors and watch wildlife from the oversized deck. Take a short 10 minute walk or 2 minute drive to the lake where you will find a swimming area, covered fishing, and boat launch. Upper Level Open living room, vaulted ceilings, floor to ceiling windows, breathtaking views. 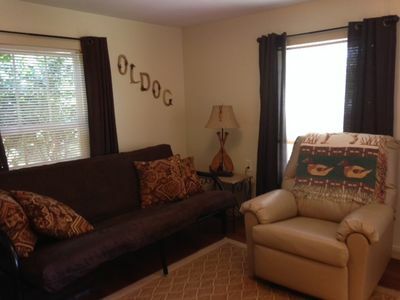 Oversized leather furniture provides plenty of room for everyone to sit. Master bedroom is large w/ queen bed and double sink in bathroom. 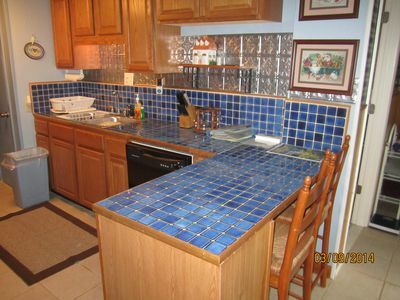 Fully equiped galley kitchen, dishwasher, washer/dryer/sink in laundry room. Dining table has room for 8. Walk out oversized deck is private and features, fire pit w/ seating, gas grill, tiki torches, dining table, dimmable lighting, and ceiling fans. Lower Level Bonus 2nd open living room great for kids to have own space. Walk through the french doors to the outdoor patio area. Great for hammoks. Two more bedrooms one with a queen bed and the other with 2 twin over full bunkbeds. Bathroom contains two seperate sink/vanity. 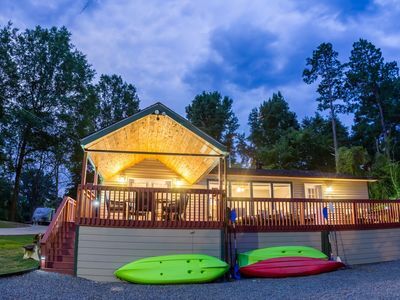 Stunning get-away in Lake Ouachita prime location! 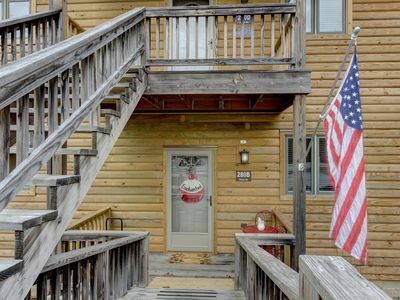 Feel the stress melt away when you step into this home in a prime location on Lake Ouachita. A rare find, as this property sits on 5.5 acres bordering Corp of Engineers land on Lake Ouachita. Take a short hike to the lake from the house or take your boat to the Twin Creek boat ramp close by. Mountain Harbor and Shangri La marinas nearby. The open living room with vaulted ceilings, floor to ceiling windows and stone fireplace provides plenty of room for your entire group to unwind. 2 bedrooms & 1 bathroom on main level--one bedroom with a queen bed and another bedroom with 4 bunk beds. The upstairs bedroom has a queen bed and second bathroom. 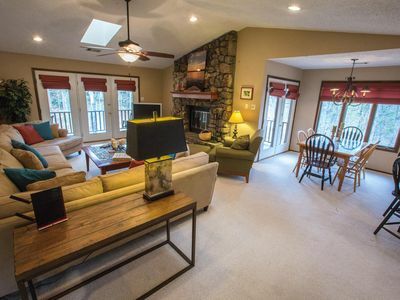 Relax and watch wildlife from the large screened porch overlooking the woods. Enjoy looking for crystals on the property. A peaceful retreat at its finest. Owner is a licensed real estate broker in the state of Arkansas. 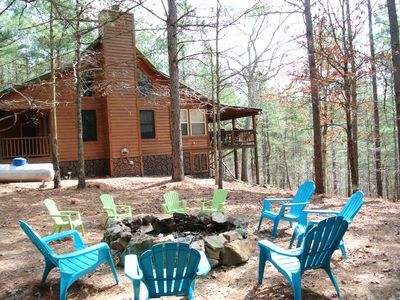 When Visiting Lake Ouachita or other attractions here in Montgomery County Arkansas, stay here at Jan's Cabin. 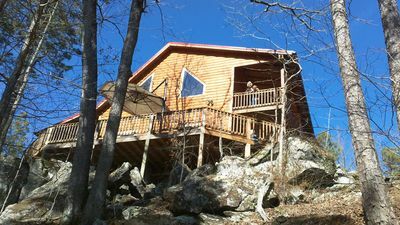 The two story cabin is nestled in the Ouachita Mountains and .8 miles from Twin Creek Access to majestic Lake Ouachita. A circle drive makes for easy entry and exit with a boat. Jan's Cabin comes with spacious family room with a flat screen TV/cable. For sleeping arrangements the upper level of cabin has 3 bedrooms 2 1\2 bathrooms, 2 queens beds, a full, a twin, and a fold-out queen couch. The dinning area has an 8 piece set up with a fully equipped kitchen. 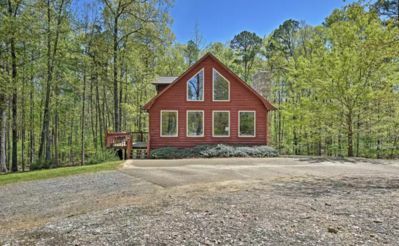 The upper level has a screened-in deck that hosts a coffee table to enjoy the Forrest view. The lower level can be rented with the upper or alone. The lower level has a bathroom, washer and dryer, TV, refrigerator and microwave. Come Be Our Guest! Nice, newly remodeled large cabin; sleeps up to 8; one bedroom (2 bunk beds) with additional sleeping in living area (queen bed and hide a bed); one full bath; complete kitchen (refrigerator, stove, micro, coffee pot, toaster oven, dishes, pot and pans); lots of seating and covered front porch; ample parking for several vehicles/boats; lake access across the highway or 2 miles to a concrete launching ramp. Owl Creek Lodge is the perfect escape from civilization ... serene, secluded and nestled in a hillside surrounded by the Ouachita National Forest ... hidden between two beautiful lakes adjacent to Hot Springs National Park, Arkansas ... with quick and easy access to marinas, swim beaches, picnic areas, fishing docks and boat ramps on either of Lakes Ouachita or Hamilton. The Lodge has 3 stories with over 3000 square feet capable of sleeping 16 people comfortably ... perfect for family reunions, weddings, corporate retreats, hunting parties, mountain bikers and nature lovers. It is overloaded with amenities such as a basement game room featuring billiards, table tennis, foosball, darts, karaoke, big screen, kitchenette and trundle bed. Walk out onto the patio and you will find a 6 person hot tub, deluxe charcoal grill, and a large picnic table with seating for 12. The main floor is surrounded by a wrap around deck furnished with adirondack rocking chairs, porch swings, game tables and an artists easel with beautiful views of the emerald forest ... like a giant treehouse. 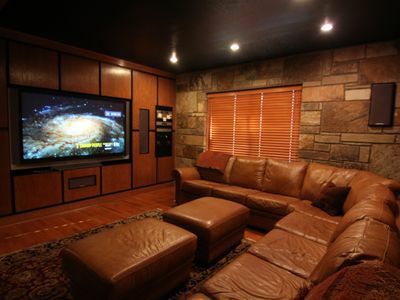 In addition there are 3 big screen televisions and a sound bar connected to satellite television and wifi. Lake Ouachita is Arkansas' largest and most beautiful lake ... highly regarded as the cleanest lake in the USA and also known as the "Striped Bass Capitol of the World!" Geologists from all over the world come to this lake to study it's unique geologic features or to collect it's beautiful quartz crystals and other minerals. It's a rock hounds paradise! Below it's dam flows the Ouachita River ... which widens into Lake Hamilton ... an urban lake that curls around the City of Hot Springs featuring beautiful mansions, restaurants and night clubs accessible by boat. In addition to all these amenities the Lodge is only 12 scenic miles from Bathhouse Row in Hot Springs National Park ... America's world famous spa. Here you can find too many things to do... from bathing in the natural geothermal springs known for it's healing powers ... or gambling at Oaklawn Casino and Racetrack ... to enjoying it's many tours, quaint shops, restaurants and night clubs ... things that make Hot Springs the number one tourist destination in Arkansas. To learn more about all of these wonderful amenities ... check out our "Owl Creek Lodge" tour guide on Facebook. Sleeping Arrangements: The main floor has 2 master bedrooms with 1 King and 1 Queen size beds ... featuring private access to a full bathroom and deck. The top floor has 2 queen size beds in the loft area ... 2 twin over full size bunkbeds in a private room ... and 3 EXTRA private single rooms with twin size beds in each. The EXTRA rooms ... if needed ... will add $20 per room per night to the nightly rate. The walk-out basement has a private bedroom next to the game room with 2 twin sized mattresses in a trundle bed, big screen TV with sound bar and private access to a full bathroom and laundry room ... featuring private access to the patio and hot tub. Super Affordable and Bring the Pup ! Next door to Oldog's Little Red Cabin!! 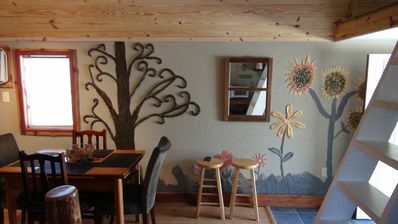 Fully furnished cottage, perfect for a week or a weekend get away. Only .3 miles from Mt. Harbor entrance and .6 miles from the entrance to Shangri La. This cabin includes 1/br and 1/ba with complete kitchen fully equipped...just bring your own groceries to cook all your meals if you desire. The futon in the living room and roller bed provide additional sleeping accommodations for extra family/friends. Plus, a safe, spacious place to park your boat, camper and/or water toys! Close by is boating, fishing, crystal mining, biking and hiking! Oldog Cabins are conveniently located to several major marinas on the lake. At Mountain Harbor, families can enjoy a supervised horse back riding experience.. through a safely guided trail....(my family loves it )... at Ouachita Shores Marina ( 2.5 mi west of the cabins), new party barge boats are available for half day or all day excursions...Twin Creeks ( 2.75 mi. west of the cabins)....boat launch, swimming, day picnics, let the Lab jump into the lake...woo woo.!! Multiple trail heads are close by....the closest....less than a mile away....many of our guests have bragged on the experience. At the end of the day....all of the comforts of home....flat screen TV....DirecTV connection....Weber charcoal grill, utensils provided...and games for the little ones !! Additionally, don't leave man's best friend at home....OLDOG....loves the pups !! So bring your pets with you. This is a real cabin experience....NOT like staying in a condo or motel....just read the reviews and examine the cabin photos....which very accurately depict life at the cabin. We have many returning guests....of which we are very proud....and frankly, that is a testament to the experience they had at Oldog Cabins. 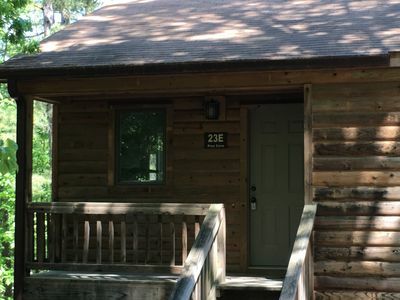 So....you be the judge.... come experience the MOST affordable cabin getaway in one of the most pristine areas of the Ouachitas. The published rates include double occupancy. There is additional charge of $25 per guest per night above two (2) occupants, children 12 and under stay free. Allowed pets are a one time fee of $30 per stay/per pet. The cabin normally has a 2 night minimum stay. 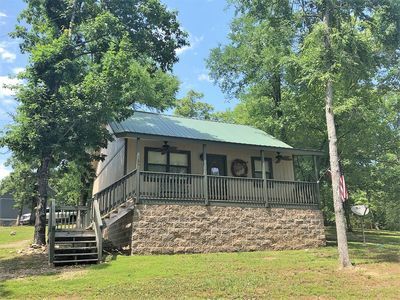 However, for Memorial Day, Independence Day and Labor Day Holidays, when there is a 3 night minimum stay, Please come and enjoy a relaxing cabin experience located in the middle of the beautiful Ouachitas !! SPRING BREAK on the LAKE! Luxury waterfront home. March dates available! Luxury Waterfront Vacation Rental on Lake Hamilton, entire Home 3 Bedrooms, 3 Bathrooms, Open floor plan. New construction vacation rental on Lake Hamilton. Boat dock completed. After you inquire by email and you need more info I can be contacted by phone 501-413-8334. Enjoy the serene views of Lake Hamilton with windows on the water. These floor to ceiling windows offer tranquil views of the lake from the kitchen, dining room, living room, master suite, and entire upstairs. We are close to Mid America Science Museum, Oaklawn Racing and Gaming, Garvan Woodland Gardens, Bath House Row, and Historic Downtown Hot Springs. There's also Magic Springs Theme Park, Ziplining, and countless hiking trails close by. Another Hot Springs favorite is mining for Crystals and valuable minerals throughout the Hot Springs area. Of course, you are in the "Spa City", so there are many opportunities to enjoy the tranquility of being pampered, with a relaxing massage, a facial, or just enjoy the experience of the exotic and ancient waters of Hot Springs, Arkansas. The moment you enter our home, you feel worlds apart from the hustle & bustle of city life. A unique feature of our property is the location we are at on the lake. Because we are only a few miles from the dam, when the gates are open, it creates a mist over the lake that looks so mysterious and magical at the same time. It can last a few minutes or a few hours. The foggy mist always seems so captivating. Sip your coffee while listening to the lull of rain on the metal roof of the perfect over size back porch. Or during the quiet early mornings, while watching the many wild life right there in the back yard, including a bald eagle that frequently flies by and is easily spotted without even using a binocular. We are also located directly across the National Forest, so while you are enjoying the back yard, you have a great view of a small mountain side that is all natural, and has a variety of wonderful wildlife. Mixing modern architecture and vintage furnishings makes this a unique family friendly retreat. The open floor plan with a fully equipped kitchen makes for easy entertaining. Downstairs includes a master suite with a king size bed that has great views of the lake. There's also a guest bedroom with a queen size bed, and a full size guest bathroom with a walk in shower. Upstairs is large open area, 850 sq ft. with lake views from the entire upstairs room, it can also be used as a 3rd bedroom or game room. There's also a full size bathroom upstairs. The kid friendly manicured backyard is fully fenced and has 2 locked gates to help keep young kids away from the water. Its easy to watch kids having fun playing outside, at the same time grownups can still relax while keeping an eye on the young ones. It's the perfect setting for relaxing, BBQing, stargazing, or fishing from the private walkway. We now have a new private dock with party barge and jet ski docking space. There are boat rentals throughout the lake and for your convenience you can boat right up to the house. If you own a boat, there's a boat launch less than 5 minutes away. We have 3 kayaks that come with the house rental. We also have 2 bicycles that you can use to discover our quiet neighborhood and surrounding. This is where you come to when you want to get away from it all. You must be at least 25 years old to rent this property. Doug Woodall Built This House in 2017. Lake Getaway with Happy Vibes! Great winter rates! Relax on the large covered porch as you leave your daily stress behind. Enjoy this brand new, serene, sparkling clean lakefront home. This comfy home is a great place to unwind. Explore the lake in our canoe or bring your own boat. It's a safe and friendly neighborhood for families with children. 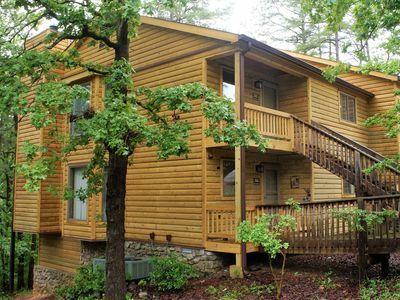 This lovely get-away is only minutes from Hot Springs attractions. Come and enjoy the “Natural State” right in your backyard. From the porch you may see blue heron, beavers, hawks, bald eagles and splashes of large bass feeding. This happy home offers a fully equipped open concept kitchen, cable T.V., wifi and AC. Enjoy dining, art galleries, soothing mineral baths, local spa services, excellent golf courses, mountain biking or simply stroll down the paths of gorgeous Garvan Woodland Botanical Gardens. 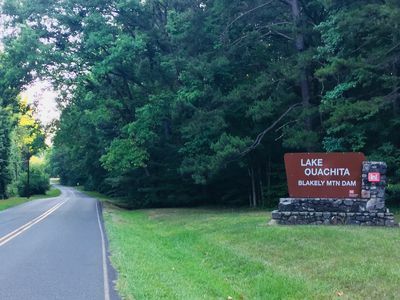 We are located 20 minutes from Lake Ouachita which is one of the country's most pristine, beautiful and magical lakes. This happy home is nestled in a sweet and relaxing setting. Travelers comment on how good it feels and how well they sleep. We are so grateful to share this joyful home with you! if your looking for a property that has it all you have found it here!!! This single level property with a full basement is perfect for all types of families large and small.This property has it all!!! 6 bedrooms, 4 full baths, game room, two living rooms, outdoor kitchen, oversized ice machine, two bed in law quarters detached from main house,, baby bed and baby accessories such as high chair, pack and play, swing, fireplace, horseshoe pit, 2 boat docks, personal boat ramp, and much more. The game room has a pool table, air hockey table, shuffleboard table, dart board, sound system, golden tee game, ms pac man/galaga machine with 60+ games programmed into the machine, and a game table for checkers and chess. There are two washers and dryers, one upstairs and one downstairs. 3 large refrigerator/freezers and one large deep freeze. An outdoor kitchen with dual gas grills, fish cooker, and smoker. Large outdoor fireplace with plenty of wood for smores and a covered seating area for 12+. The house and out building has the capability of sleeping 22-24 adults and children. 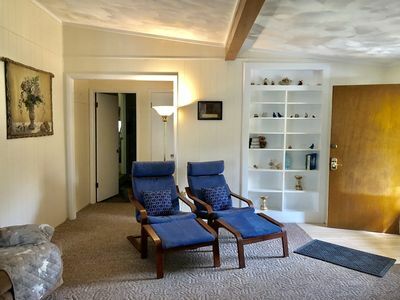 There is a large oversized sitting area upstairs in the sun room overlooking the lake to accommodate 20+ people. plenty of parking in the driveway and across the street. The homeowner owns the land across the street for additional parking of boat and jet ski trailers. there is also a sister property next door for rent that sleeps 14+. Plenty of board games and playing cards for family fun. 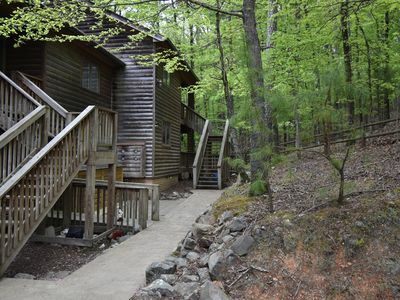 Guests are sure to enjoy a memorable vacation in this fully furnished, 3 bedroom/2 bath cabin. The master bedroom is upstairs/loft and has a queen size bed with a full bathroom (shower, vanity, toilet & closet). The 2nd bedroom is downstairs next to a full bathroom (shower, tub, vanity & toilet) and furnished with a full over full bunk bed with a twin size trundle. The room has a closet, a TV, and toys and books for children. The 3rd bedroom is a sun room with a twin size daybed with a twin size trundle. The bed turns into a king size bed when the trundle is pulled out. The room has a TV and storage space for your belongings. The cozy living room is furnished with a comfortable couch, which is also a queen size sleeper sofa, and 2 chairs with a TV. The kitchen is perfect for dining with essentials for normal cooking and dining equipment. 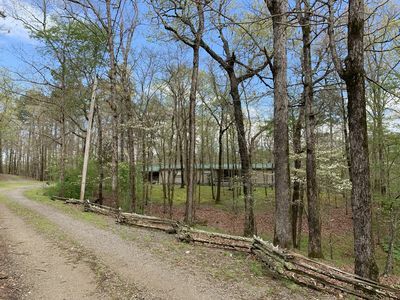 Situated on close to 5 acres of wooded land, guests can enjoy morning coffee in the back deck, an afternoon of many activities available in the surrounding areas, and later watch the sunset as you sit around the fire. Spend the day away, enjoying nearby attractions such as Lake Ouachita State Park, and many more in Hot Springs. Sleeps up to 11 people when full/queen size beds are shared. All linens provided. Cozy up to fireplace or toast marshmallows around the fire pit. Book now!! 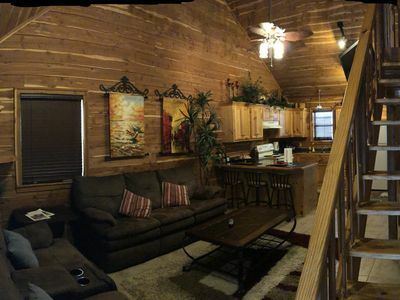 Such a nice little getaway cabin in a quiet cove on Lake Hamilton. The log cabin feel inside is so relaxing you won't want to leave. You'll enjoy unlimited access to the swim beach and common area that includes patio, large fire pit, boat slips, grass volleyball/bad mitten court, fishing pier, paddle boat and horse shoes. If you're looking for a peaceful escape and still be near all of what Hot Springs has to offer, you found it. Newly listed, just15 minutes from Central Ave. in Hot Springs, this home is in a quiet neighborhood tucked away on the outskirts of town. 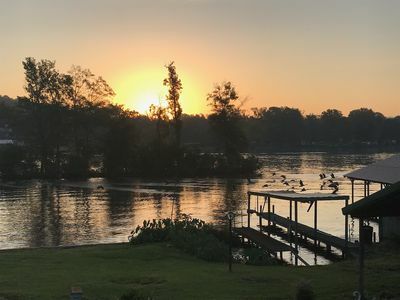 Wake up to a beautiful sunrise and cardinals feeding off the deck each morning before you start your day whether it be on the lake, adventures in town, or in our beautiful national parks hiking, or just checking out the scenery along the way. This property has a big open yard with lots of room to enjoy the outdoors. The island provides some shelter from the main part of the lake giving a secure area to swim and play. 7 guests can sleep comfortably in this cozy home away from home. The gallery kitchen is complete with cooking utensils, small appliances, and everything you should need as you gather to enjoy family meals together inside or out on the back deck. Wifi is available, and cable on the flat screen TV for those quiet nights in. Welcome to our lake house! Between the Lakes Base Camp is nestled in the woods one half mile at the end of a paved road. The home has a double covered boat garage and a double covered carport with entrance to the home. Enjoy relaxing in the window enclosed backroom that has plenty of seating with a couple of cozy chairs, a couch, two futons. table & chairs and a gas heater to keep you warm. You are likely to see deer while looking out the windows into the woods. 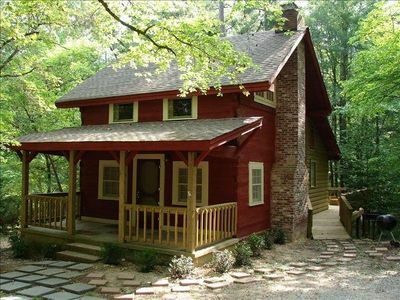 Take time to enjoy the peaceful ten acres, fire pit and walking down to the creek. Gas stove/oven/broiler, microwave, crockpot, refrigerator, dishwasher (detergent provided), coffee maker (filters provided) and a Keurig coffee maker (K-cup pods provided). We provide cookware, tableware, kitchen detergent, hand towels and paper towels. Two 3 piece towel set per guest and comforter, linens and pillows for each bed. New washer and dryer (detergent provided) for guest use. Bath soap, a supply of toilet paper, facial tissue and a hair dryer in each bath. Please bring your preferred hair care products. There is also an iron and ironing board. New propane grill (propane tank provided) Outside fire pit with chairs provided for the fire pit area. LAKE HAMILTON LAKE HOUSE! MAIN CHANNEL VIEW!! WITH BOAT DOCK, JUST UPDATED!!!!!! Come enjoy the beauties that Hot Springs has to offer in our nice 2 Bedroom and 1.5 Bathroom lake house that has been completely updated. 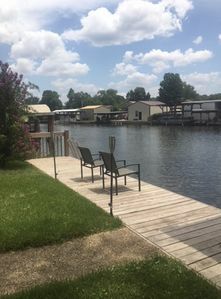 Enjoy a day on the lake with your family and take advantage of the brand new boat dock that will accommodate just about any boat or the dock also has a swim platform if you choose to just hang out and enjoy it . The home is located on the main channel of the lake so the views are wonderful for evening grilling or just relaxing in our new Hot Tub. 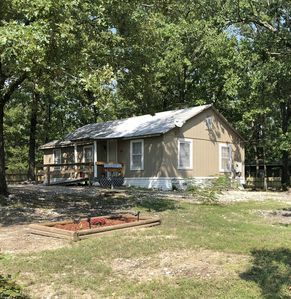 This property is conveniently located minutes from town and on quiet safe little dead end road with no issues. FREE ONE DAY PARTY BARGE WITH ANY 3 DAY RESERVATION MADE THRU MARCH 2019!!! RENT OUR CABIN FOR A MINIUM OF THREE NIGHTS AND GET THE USE OF OUR THIRTY FOOT PARTY BARGE FREE FOR ONE DAY! THAT IS A $400.00 VALUE FREE! ALL YOU PAY FOR IS THE OIL AND GAS THAT IS USED! THIS OFFER GOES THRU MARCH BUT IS GOOD FOR WHATEVER DATE YOU CHOOSE TO RENT OUR CABIN. This cabin has it all!!!!! Located centrally in an area that offers everything from crystal digging to horse racing. Great view of the Ouachita mountains. Five minutes from the crystal capital of the world, Mt. Ida Arkansas. Lake Ouachita offers great fishing and family fun and is only ten minutes away. Come and try a guided fishing trip on the lake. Muddy Creek Wildlife refuge is just around the corner. Offers some of the best turkey and deer hunting in the country and is fifteen minutes away. 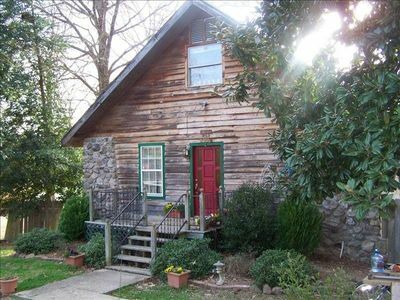 Oaklawn park, in beautiful down town Hot Springs is a mere thirty minutes from our little cozy cabin. Come and enjoy the lights and the horse racing of beautiful Hot Springs and then come to our secluded cabin and enjoy the peace and quite! 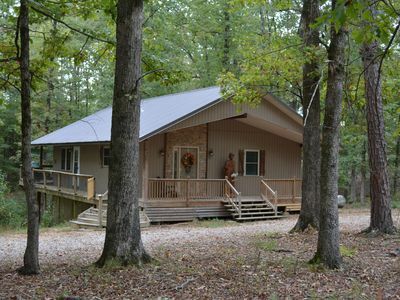 Our area has something to offer for everyone and our cabin is located right in the middle of it all! 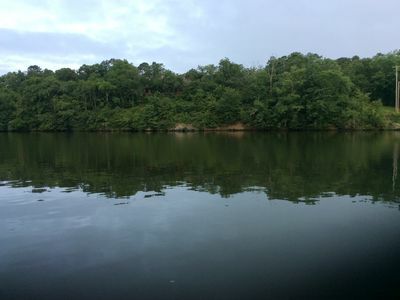 Also available to our renters is a 30 foot party barge located on beautiful Lake Ouachita. The party barge is available for rent and is located just a few miles from the cabin in a boat slip. Come enjoy beautiful Lake Ouachita and the many islands. Hot Springs Lake Hamilton LAKEHOUSE - READY FOR RACES! !